HMD Global, the company that is taking care of the Nokia brand, has launched the a true flagship device for the legendary name in the mobile industry, meet the Nokia 8. 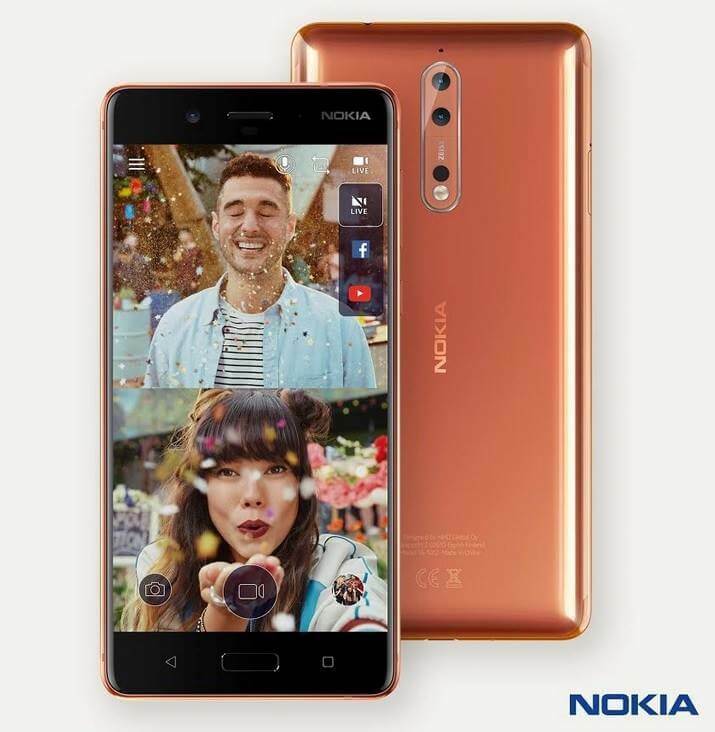 The Nokia 8 boasts a 5.3-inch display with Quad HD resolution topped with Gorilla Glass 5 for protection, housed in a splash-proof (IP54) premium body made of precious metal that is beautifully crafted. On the inside, it uses the latest chipset from Qualcomm, which is the Snapdragon 835, the same thing found on other flagship devices like HTC U11 and Sony Xperia XZ Premium. The 2.5GHz 64-bit SD 835 processor is complemented by 4GB of RAM for smooth multitasking, and 64GB of ROM plus micro SD card slot that supports up to 256GB of additional space. The camera department also got the best in class hardware. At the back, there are two modules, one with 13MP resolution colored sensor plus another 13MP monochrome sensor, both with Carl Zeiss optics, f/2.0 aperture size, optical image stabilization, phase-detection auto-focus, and IR range finger for fast focusing. Meanwhile, the secondary shooter is also equipped with 13MP f/2.0 sensor, PDAF, and has screen flash. HMD will also bring the Nokia Ozo Audio, which records audio in 360-degree, however, there is not much information about this feature, so we really do not how the Nokia 8 will achieve this kind of thing. In comparison, HTC U Ultra also sports 360-degree audio, which is made possible by the four individual microphones located on different parts of the phone. Other notable specs are front-mounted fingerprint sensor, LTE connectivity, USB Type-C port, 3090mAh battery, and runs on the Android Nougat operating system. The global roll-out will start on September with an average retail price of 599 euro (US$700) or about Php36, 000 when converted directly.